Ruth Jefferson is a Labor and Delivery nurse practicing at a hospital in New Haven, CT. She has been there for more than twenty years and is an accomplished and valued employee. One very busy shift, Ruth finds herself caring for a newborn and is forcefully asked to leave the room. Mystified as to what she could have possibly done to offend the new parents, her supervisor tells her she is off the case and reassigned a new patient. The only explanation being a post it note on the patient chart forbidding African-American staff from touching this baby. Finding herself shaken on multiple levels, Ruth - the only African American nurse on this floor, accepts this decree only to accidentally be left watching the same baby a few days later in the nursery. When tragedy strikes the distraught family blames Ruth. Her license is quickly suspended, charges are filed and a terrifying criminal trial begins. Ruth wants to save her career, protect her teenage son and get her life back. But deep, strong feelings that she has spent her lifetime suppressing can no longer be hidden. Equality, racism, hate and love are exploding through Ruth as she struggles to defend and save herself at the same time. 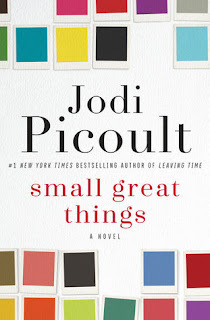 Jodi Picoult expertly brings these amazing characters to life in her latest novel. Extensive research, talented writing and much of her own heart is poured into this glimpse of contemporary America and our battle with racism. Where we live, work, how we treat others and how we want to be treated affect each and every one of us every day. Jodi Picoult weaves this incredible story and explores a variety of subjects, not just racism but motherhood, sisterhood, healthcare and our basic human rights, no exceptions. This novel has some complicated reviews, not surprising when an author chooses a complex subject. It’s sometimes too easy for everyone to be a critic with no concrete solutions. I think this novel is a HUGE success. In her afterthoughts, at the end of the novel, Ms. Picoult says “we who are white need to have this discussion among ourselves. Because then, even more of us will overhear and – I hope – the conversation will spread.” If that is what she truly set out to do, well, it worked. Beyond just recommending this book, it should be mandatory reading. I haven't read any Jodi Picoult in a long time, but this is one I've been considering. Your review has me convinced that I really need to read it! Thanks. Agree completely with you on this one. There will always be those who dismiss her work, but I thought she did an amazing job with an incredibly difficult subject. Felt like it hit especially close to home with this election.